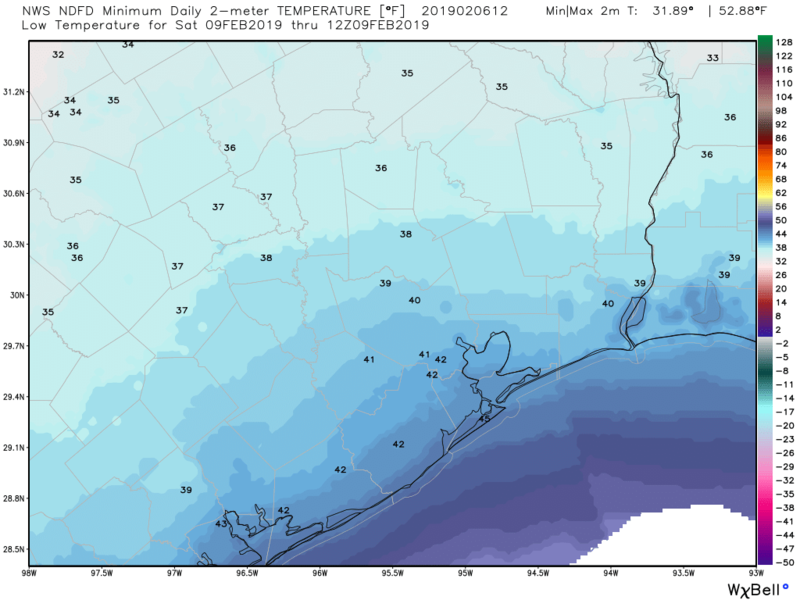 Houston appears to have set a record for a “high minimum” temperature on Tuesday, February 5th, when the low temperature at Bush Intercontinental Airport only fell to 68 degrees—breaking the mark of 67 degrees set in 1927. This morning temperatures are warmer still at the airport, with lows only bottoming out at 71 degrees as of 6:15am. Another record minimum therefore seems likely, and Wednesday’s high temperature may well threaten the daily high for February 6 (81 degrees, set in 2017). A front on Thursday will abruptly end the anomalous warmth. We can expect another warm and mostly gray day, much like we’ve already experienced this week in Houston. 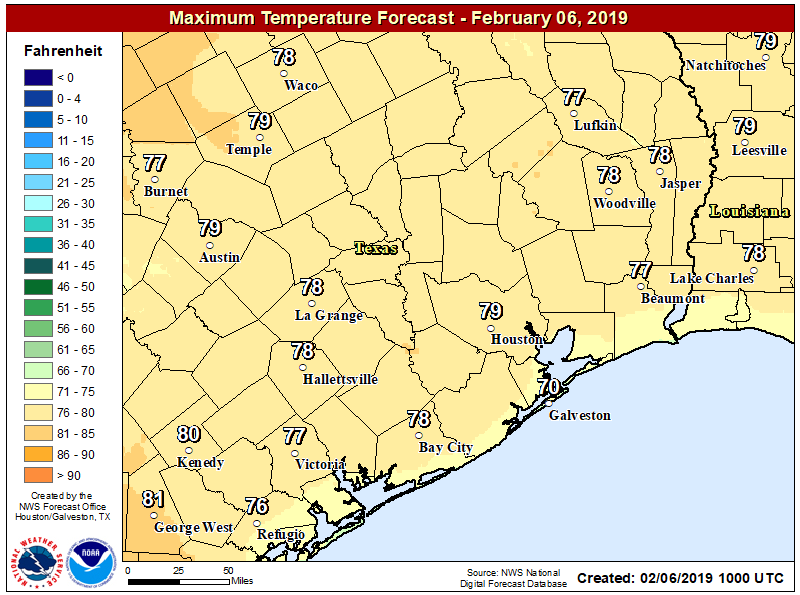 Highs should reach the upper 70s across the region, although we can’t rule out Houston’s first 80-degree mark if there are enough breaks in the clouds this afternoon. Slight rain chances will linger, but they should be only 10 to 20 percent for most of the area, with very light accumulations. Mostly just gray and warm today therefore, with south winds on the order of 10 to 15mph. After one more warm night, we’ll finally see the region’s next cold front on Thursday. In terms of timing, I expect it to move through northern and western parts of the region before noon, move through downtown around noon, and it should push off the coast before sunset. In terms of activity, we could see a few thunderstorms and some stronger winds as the front passes through with the aid of daytime heating. However, overall rain accumulations appear to be fairly low, probably no more than one to three tenths of an inch for most. After the front expect a quick cool down, as brisk northerly winds drop temperatures in the upper 30s for inland areas and low 40s closer to the coast Thursday night. These will be cold and mostly gray days, with highs in the upper 40s or low 50s. As the upper atmosphere remains disturbed, we can’t rule out some light rain later on Friday or Saturday morning, but chances are probably 20 percent or less. Lows Friday night will be the coldest, but the area is unlikely to see a freeze, even for well inland areas. This front will be here, and then gone, as the onshore flow resumes later on Saturday, setting up much warmer conditions for Sunday. Highs could be nearly 20 degrees warmer, reaching near 70 degrees. Some slight rain chances remain, along with our old friend—gray skies. The warm-up will continue into Tuesday, as highs get back into the low-70s, before a cold front later on Tuesday or Wednesday knocks highs back down. We’re not looking at anything too extreme when it comes to rains or temperatures, however. Thank you for the daily morning briefing. I always know what to wear. You both are doing a great job. I recognize that it’s still winter and we’re not out of the woods yet, but with all of these warm and muggy days we are rapidly running out of time before spring gets here for good. I mean, tomorrow’s front appears to be fairly strong and 1) we still won’t see a freeze and 2) we’re right back in the same 60’s and 70’s by Sunday. When do you all expect a sunny day again? Feel like we are in Seattle. Thank you for your weather. It is very easy to understand for us not metrologist. You guys get plenty of accolades–and deservedly so–when we have big, dramatic weather events. I appreciate you then, too. But I appreciate more that you give such accurate no-drama forecasts on a day-to-day basis. Yours is an email that it always opened as soon as I get it. Thanks, guys. If this is January, what are July and Ughust going to be like ???? YUCHHHHHHHHHHHHHHHHH this is awful. I need the sun. Thank you for your constant good work reporting this stuff guys! Unfortunately we’re about a week away from any sustained sunshine. Sorry! Booo. Oh well, I’m trying to remember it’s not 100F outside with this. Thank you! I”m praying we don’t have a freeze The trees are already budding out and some haven’t even lost all their leaves They are as confused about the season as we are. I need to fertilize my lawn. Can I start this weekend or do I need to wait a few more weeks. Any possible freezes still coming? Depends where you live. 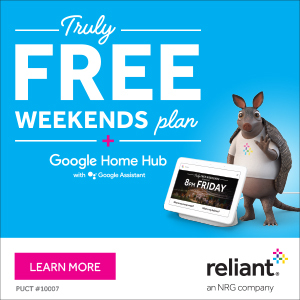 If you’re south of I-10, I’d say you’re probably safe. North of I-10 you’re definitely taking your chances.